The picture that followed was of Coach Chuck Pagano. The message was referring to the Colts' head coach, who was recently diagnosed with leukemia. Coach Pagano is currently undergoing intense treatment while an interim coach leads the team. And, as much as we enjoyed cheering for the Colts as they battled the Browns, we cheer even harder for Coach Pagano in the battle he is facing. We can relate. Our son, the one sitting beside me during that football game, is a leukemia survivor. 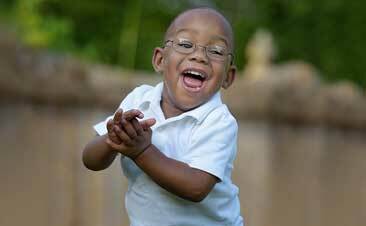 Karson was diagnosed at the age of 2. Now he is 8 years old. In fact, he just recently celebrated his birthday and the thing he most wanted as his gift was a ticket to go to his first Colts game. It just so happened that this was the day the Colts were taking collections for leukemia research and selling �ChuckStrong� bracelets and t-shirts. Karson bought several bracelets and wore them with pride. Our hearts and our prayers go out to Coach Pagano. 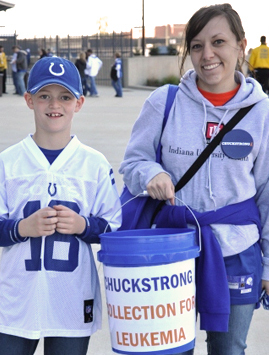 Many Riley kids and families are proudly sporting their �ChuckStrong� gear! We hope to soon see Pagano back on the sidelines of a green and lined battlefield. We�re cheering for you, Coach!